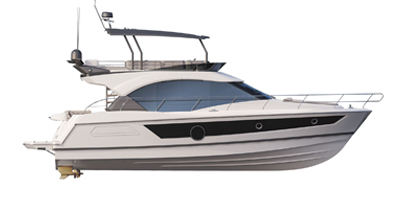 With a dynamic silhouette, slender bow and high-performance hull, the Monte Carlo 5S distinguishes itself in any sea conditions it meets. Driven by 2 Volvo IPS 600 engines, this motor cruiser is both sporty and refined, combining good power with incredible manoeuvrability. The unique hardtop lounge area on the Monte Carlo 5S is the hallmark of a luxury yacht. Seamlessly connecting indoor and outdoor spaces, the main deck features a sunroof, which opens above the driving station. The interior saloon is a very well-ventilated, elegant and comfortable living space. The lower deck boasts three cabins with en-suite shower rooms fitted out elegantly with attention to detail. Highly customizable, the Monte Carlo 5S is as charming in a modern light brushed oak ambiance as it is in a warmer matt walnut. The magnificent interiors, private lounge, sporty profile and agility of the Monte Carlo 5 S make her a stunningly elegant ode to pleasure. The Monte Carlo 5S has a genuine lounge in the hardtop area. Converting into a huge sunbathing area for four, this space is unique in its kind, equipped with an audio system, refrigerator and a canvas awning. The Monte Carlo 5S offers a choice between two cabinetwork atmospheres: brushed oak or mat walnut. Combined with impeccable finishes - cream padding with bronze reflections, brown soft touch finish and overstitched wine-coloured leather – these two woodwork options offer harmoniously attractive interiors. Below deck, the two extremely luxurious cabins have en-suite bathrooms with separate showers. The master suite aft is beam-wide and splendid hull portholes flooding the interior with soft light – a characteristic feature of the Monte Carlo range. The bed layout in the spacious, comfortable and elegant VIP suite to the bow can be adapted in two different ways. Equipped with the latest large SIMRAD screens, the steering station enjoys perfect visibility thanks to a single-piece windshield. Designed for the Monte Carlo range, the tanned leather driver’s seat is extremely beautiful and its comfort is second to none.